Being a fan of something takes a lot of dedication and time, right? Still, I find that it is a fantastic pursuit in the long run. You get to meet new people. You get to have some fun. You get to learn something about yourself and those around you. And, if your lucky, you even get the chance to face your fandom head on. My blogging mate, Shag, knows what I am talking about. Here, check out a conversation we had just the other day, whilst we were dancing to a Dutch version of 'If I Had A Hammer'. 1) How did you start blogging Shag? What's your own 'secret origin' as it were? My first blogging efforts were driven by curiosity. I'd been active on listservs and podcasts, and around this time blogging was starting to become popular. I was genuinely curious how it worked and saw it as a venue for me to blather on about whatever I wanted. So I started www.oneuponageek.com. Part of my motivation was also driven by my professional background in Marketing. I saw this as an experiment in promotions. I wanted to identify effective ways to promote a blog and drive traffic to a site. Overall I believe I was pretty successful in generating lots of hits for that site (over 1 million visitors in four years). I had tons of fun sharing my thoughts on comic books and science fiction. I'm very proud of my work on this site, and I hope to get back to it again someday. 2) I remember reading and old Firestorm comic book when he was with the original Justice League of America, back in the day. For me, personally, when I first saw Ronnie with all these other heroes, he stood out to me, more dynamic and bold. What was your first experience when you first saw Firestorm? My first real exposure to Firestorm was on the "Super Friends: The Legendary Super Powers Show". I saw his first episode and immediately ran to my nearest convenience store and bought an issue of his comic. The Fury of Firestorm: The Nuclear Man #28 to be exact. The first appearance of Slipknot! You're right, Firestorm was very dynamic and bold. Ronnie was a teenager and I was nearly a teen. I identified with Ronnie and loved his excitement for the superhero lifestyle. 3) In your own words, Shag, how would you describe firestormfan.com, and how did this website come into existence? 'Firestorm Fan' is the source for DC Comics' Nuclear Men. You'll find anything and everything Firestorm-related there. Things such as merchandise, comics, toys, apparel, cartoons, news, creator interviews, and commentary about the character is covered. All incarnations of the character are celebrated there. Additionally, this site serves as one of the homes for 'The Fire and Water' podcast; the official podcast of 'Firestorm Fan' and 'The Aquaman Shrine'. Just to be perfectly clear, my site is not affiliated with DC Comics in any way. My Firestorm site came into existence after I'd been running 'OnceUponAGeek' for almost a year. While I loved writing a blog about anything and everything geeky, I wanted to start another site that really focused on one subject. I was a big fan of other comic book character blogs, such as: 'The Aquaman Shrine' (for the chap with the gills), 'Speed Force' (dedicated to the Flash), and 'Idol-Head of Diabolu' (about to the Martian Manhunter). 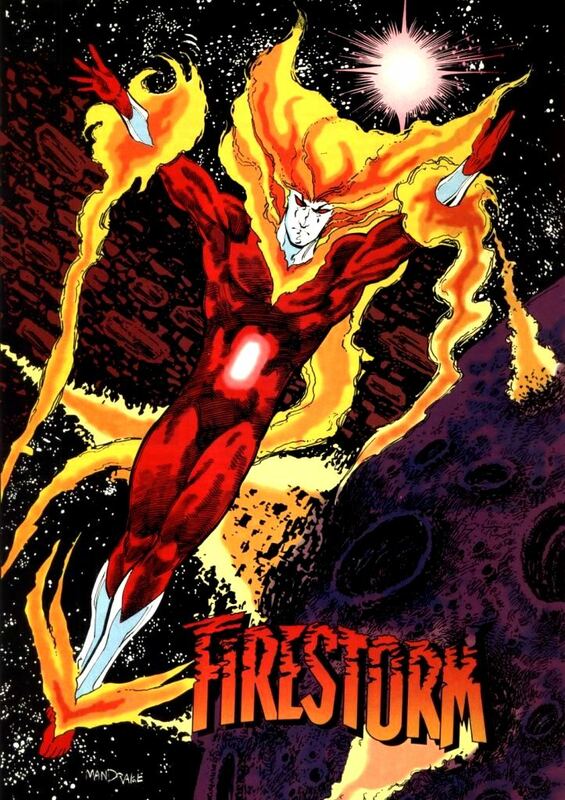 Firestorm has always been my favorite character, and after searching around the web I wasn't able to find an active blog dedicated to the character. There are a handful of good reference sites and some defunct sites, but no active blog. Thus FIRESTORM FAN was born! 4) What piece of music, movie, or object, would you say your site was like, and why? I like to think this is John Williams' world and we all just live in it. He's written the soundtrack to all our lives. If you think of FIRESTORM FAN as a piece of John Williams music, I'd have to say it's the soundtrack to Harry Potter. The reason is because I try to keep this site as up-beat as possible. While I could be negative and talk smack about aspects or issues, I prefer not to. I want to celebrate the character and share an infectious optimism with fellow Match-Heads (fans of Firestorm). I've always thought Williams' soundtrack to Harry Potter is up-beat and full of positive-feeling music. 5) Can you please rank your favourite 'firestorm era' from highest to lowest (Gerry Conway, John Ostrander, Dan Jolley, and Gail Simone). I'm going to have trouble answering that question. I love every era of Firestorm. I can find fantastic aspects in each incarnation of the character. So I'd rather not rank the various Firestorms because that would leave one incarnation at the bottom, and none of them are at the bottom in my opinion. I will say that while I enjoy every version, the classic Ronnie/Professor team was my first and it really made me passionate about the character. So if I had to pick just one, I'd probably pick that version. 6) Do you have any amusing stories about your site? Also, have you had any creator recognition. I keep tabs on Firestorm across the net. One of the ways is through "Google Alerts". I get daily e-mails from Google featuring current news and stories that contain the word "Firestorm". You wouldn't believe how many journalists use the word "firestorm" to describe celebrity gossip and politics! Sorry, I don't care what Paris Hilton said, it doesn't truly generate a "social media firestorm". 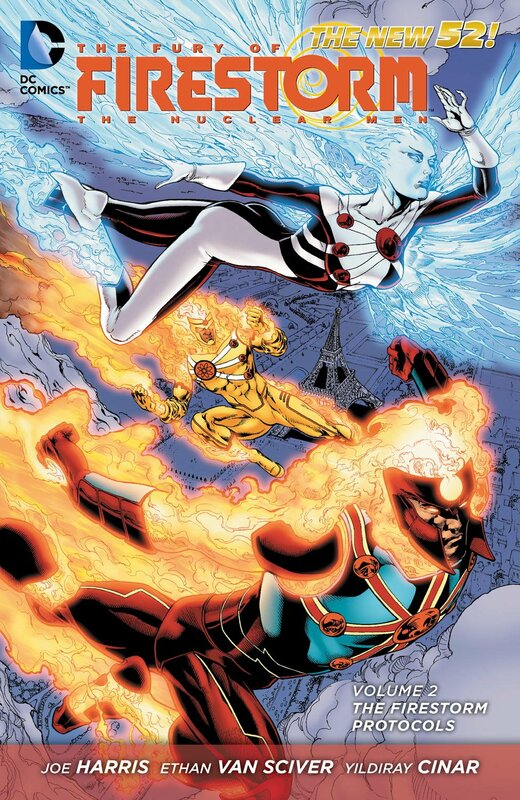 I've been incredibly fortunate to interview several Firestorm creators, such as: Gerry Conway, Al Milgrom, John Ostrander, Stuart Moore, Jamal Igle, Ethan Van Sciver, and Gail Simone. Other creators have been very supportive of the site, such as: Yildiray Cinar, Joe Harris, Rafael Kayanan, and Dave Beaty. DC Comics has even mentioned Firestorm Fan through their social media efforts a few times. Interaction with the creators is probably my favorite thing about running the site. Each of them are fantastic people and have a real passion about the character. If I wasn't running the site, I never would have had those opportunities to communicate with them. 7) If could cast the current Firestorm series, who would they be and why? I'm terrible at these casting games. Let's see. I could envision Ronnie being played by a young Mark Wahlberg (we're talking early 90s). Jason could be played by young Anthony Mackie. 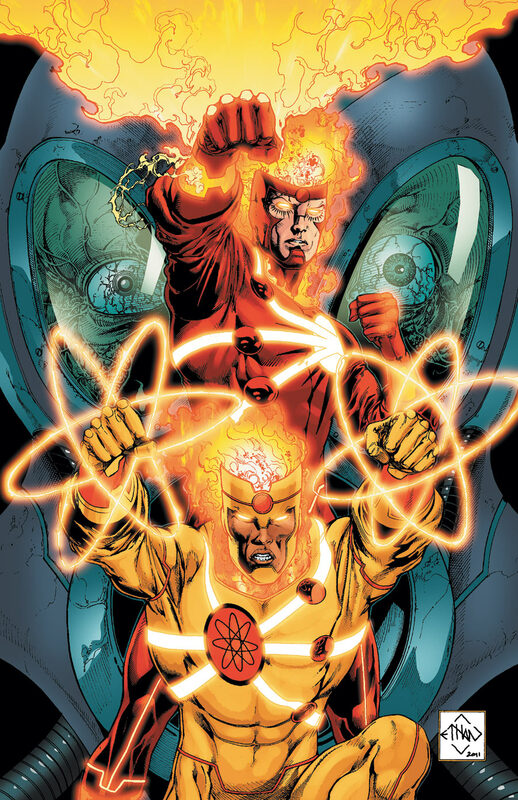 8) What's the best thing about Firestorm compared to the other heroes. If you are talking about the classic Firestorm, I'd have to say his love of being a superhero. He's enthusiasm was boundless and he always used his powers in larger-than-life ways. For example, if someone was hurtling to their death, instead of just making the concrete below softer, Firestorm would create an enormous rubber duck for them to land on. Wild stuff like that. It was always fun! If you are talking about the current Firestorm, I'd have to say their power-level combined with the international intrigue. Ronnie and Jason have themselves caught up in a nasty game of political power and they don't even know it. Combine that with their astonishing powers and you've got a fantastic superhero story! 9) If your website was a 'singleton' looking for a 'date', who would that date be and why? Ummm... is there a Power Girl blog out there? Ha! Thanks for that Shag. Your a pal. So if you want to know more about my pal and his sites, please check out firestormfan.com, or his related twitter, facebook, and gplus pages. You won't be sorry that you did, right buddies?